Movie Star and Rock ‘n Roller, Big John Burns, is an original but could easily be mistaken for “The King.” Along the “Mother Road,” Rte. 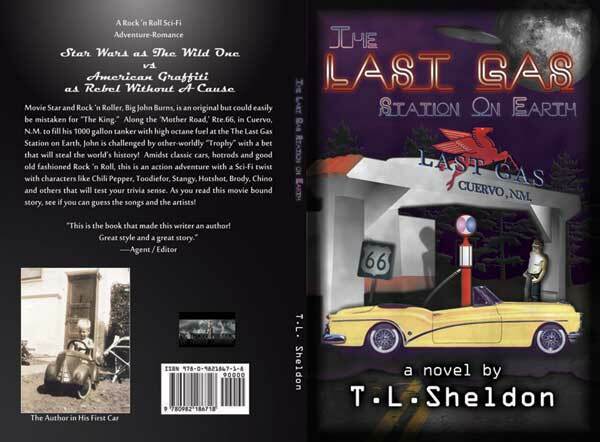 66, in Cuervo, N.M. to fill his 1000 gallon tanker with high octane fuel at The Last Gas Station on Earth, John is challenged by other-worldy “Trophy” with a bet that will steal the world’s history! Amidst classic cars, hotrods and good old fashioned Rock ‘n Roll, this is an action adventure with a Sci-Fi twist with characters like Chili Pepper, Toodiefor, Stangy, Hotshot, Brody, Chino and others that will test your trivia sense. As you read this movie bound story, see if you can guess the songs and the artists!